Dr Truby completed his PhD in applied physics with Professor Jennifer Lewis at Harvard University. Ryan is a materials engineer who, as a Schmidt Science Fellow, is pivoting to work in robotics. 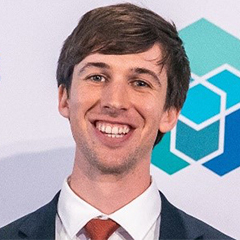 During his PhD, Ryan developed new ways to use 3D printing techniques to create machines out of functional soft materials. Now, working with Prof Daniela Rus within the Computer Science and Artificial Intelligence Lab at MIT, Ryan is investigating new control strategies for soft and compliant robots. His pivot into robotics is enabling him to bridge his two fields, and by doing so, design new robots with unprecedented capabilities and explore new applications for soft robotics. As a PhD student, Ryan invented the ‘Octobot’, a world-first, hardware-free autonomous soft robot. The potential of genuinely soft robotics and autonomous control is huge. His current projects aim to use soft robotic manipulators that have the necessary biomimetic sensory feedback to improve how robots manipulate objects for a variety of tasks. The technology could revolutionize product handling, manufacturing, human-machine interfaces, and many other applications that are difficult or inappropriate with traditional “rigid” robots. Ryan grew up in West Texas and took his first degree at The University of Texas at Austin.